As we all know, food and drink make any occasion special, but there’s just something extra magical about crunching leaves, bonfires, football season, and scarves that make us all want to hold tightly to our loved ones and a fun, warm drink. Let’s start with my personal favorite fall beverage, the chai latte. Though almost any coffee shop has this coffee drink, I have a few favorite Fort Wayne stops that always make them creamy, frothy, spicy, and delicious. Conjure Coffee is a fun downtown coffee shop that offers a great chai, and they can even add some impressive latte art! Plus, you can take some whole beans to go from their roastery. Fortezza Coffee also whips up an excellent chai, and their brunch is both really fresh and to die for as well. If you’re looking for a drink that’s warm and festive, but a little unique, Firefly Coffee House offers a wonderful caramel apple latte, caramel cream latte, vanilla nut latte, pumpkin pie latte, and a smashing pumpkin chai. I also love popping in to see what handmade items they currently have for sale. And, if you’re in the mood for a frozen drink, I highly recommend their peanut butter milkshake! 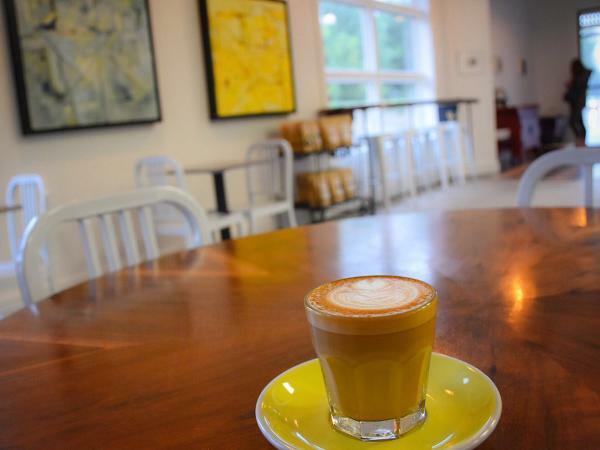 Mocha Lounge is another Fort Wayne coffee with some of the best seasonal fall drinks. I get a pumpkin spice latte (a classic!) or a cappuccino. It’s also conveniently close to Umi, a seafood and sushi restaurant in Fort Wayne that’s great for a classy night out. If you like frozen drinks (and adult beverages) el Azteca actually features a delicious pumpkin margarita in the fall. If you love a good adult fall beverage, Kekionga Cider Company offers delicious, fresh-pressed apple cider (both hard and soft). I’m not much of a beer person, so cider is right up my alley. However, Trubble Brewing does offer a Monster Mash Marshmellow Imperial Stout in the fall that is a must-try. If you want a place that offers both great coffee and cocktails, Old Crown is a must-visit. They also have exceptional wraps and healthy lunch options. If you’re feeling bold, give the Hot Toddy a try at Wine Down. It’s said to have medicinal benefits because of its lemon, fresh ginger, and other spices. My personal favorite autumnal cocktail is “A Very Spicy Mary” crafted at Paula’s on Main. It’s hearty yet invigorating because of the fresh rosemary and veggies. Cozy up in Fort Wayne, Indiana this fall with your favorite beverages, or, try something new that’ll get you in the spirit of the season! Crystal is proud to call Fort Wayne home and loves sharing with others all of the incredible fun and opportunities it has to offer. She holds a Master’s in Business Administration from Indiana Tech University and bachelors’ degrees in Theatre and Sociology from IPFW, but considers herself a lifelong learner. She and her boyfriend started a small town travel blog (www.saturdaysightseers.com) to encourage families to find the adventure in their own backyards. When she’s not out exploring, she can be found watching “The Office,” eating dessert at a Fort Wayne favorite, or ballroom dancing!